The E-Learning Heroes community is a fantastic spot for support and resources … but you have to admit, there’s a lot going on! Since no one likes to feel like they’re shouting into the wind, how do you make sure your forum discussions don’t get lost in the shuffle? Here are some tips that can help your posts grab the community’s attention and get you some answers lickety-split! Since E-Learning Heroes is all about asking questions of your fellow designers/developers, chances are someone else has already asked, and answered, your question about an Articulate product. So before you draft a new discussion thread, see if you can save yourself some time by clicking the magnifying glass icon on the E-Learning Heroes search bar first to see if anyone else has posted a similar discussion. To access search, simply click on the magnifying glass icon in the upper right corner, anywhere on E-Learning Heroes. Once clicked, the icon shifts to the left, giving you a text field where you can enter your search terms. E-Learning Heroes will return a list of relevant results in the form of links to articles, discussions, or series. To narrow your search, use more specific terms. To broaden the results, simply remove search terms. E-Learning Heroes is the place for starting and participating in great conversations. I like to think of it as a bustling metropolis full of different neighborhoods where people from all walks of life gather to share their ideas and help each other out. In E-Learning Heroes, those neighborhoods take the form of discussion forums. You’ll find all of our discussions conveniently grouped under the “Discuss” menu option. And just like in any big city, with E-Learning Heroes you’re always better off asking for advice from locals. For instance, a request for help with troubleshooting a trigger in an Articulate Storyline project may languish for awhile if you post it in the Building Better Courses forum. Likewise, community members may be a bit slower to respond to questions about general e-learning or instructional design ideas when they’re posted in software-specific forums. If you’re looking to discuss general course building or instructional design questions like “How do you write learning objectives?” or “What tools do you use for project management?” or “What is your design process?”—post those in the Building Better Courses forum. Have a question about how to work with sliders in Articulate Storyline? Or maybe a question about how to customize the menu in Articulate Studio? Post those discussions in the relevant software forums. 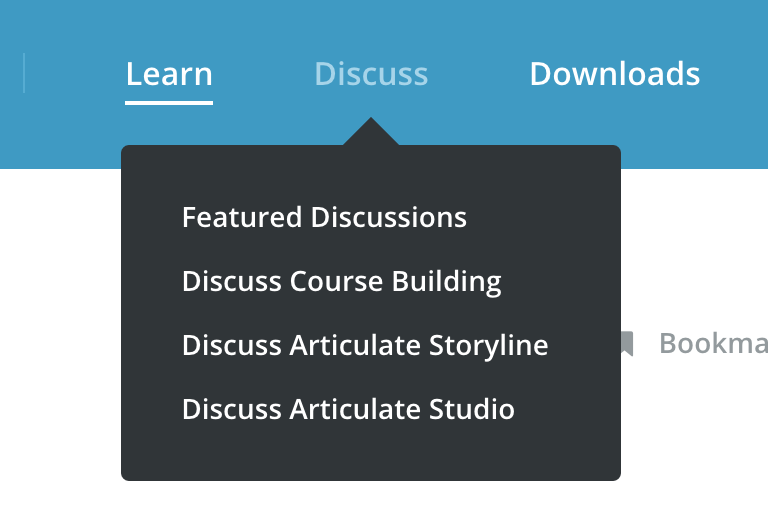 E-Learning Heroes gives you access to forums for help with all Articulate products, including Articulate Presenter, Articulate Replay, Articulate Engage, Articulate Quizmaker, and Articulate Online, and even a forum for discussing Developer SDKs and APIs. These forums are a great way to tap into the ELH locals— the folks with software-specific expertise—who can offer up quick answers to all of your how-to questions. Most of us are busy people with too many demands on our time and attention. We tend to skim over content, only deep-diving into the items that really catch our eye. This means when you’re drafting a new discussion, your goals should be twofold: 1) To entice people to read and respond to you, and 2) To give those people just enough detail to be of help or to participate in a good conversation with you—without being overwhelming. With those goals in mind, here are a few pointers for making sure your discussion posts are both enticing and effective! Make it snappy. I know it may sound a little gimmicky, but giving your discussion a snappy title that’s concise while still providing some context for your question is the perfect way to invite others to read more, dive deeper, and engage with you. Keep it concise. When you’re new to the neighborhood it’s natural to have a lot of questions about the best places to eat, the coolest places to shop, the easiest route to get downtown, etc. But even the nicest, most welcoming neighbor is going to get overwhelmed pretty quickly if you ask her for all of these things at once! When writing the body of your discussion, aim to summarize your needs in one concise sentence. If you find that you’re struggling to do that, take a step back and edit yourself before you post your discussion. Focus on prioritizing the need-to-know items over the nice-to-know. “I’m brand-new to Storyline. I need someone who can explain triggers, variables, states, and layers? Also, when is it a good idea to use a variable? When is it better to use a state versus a layer? 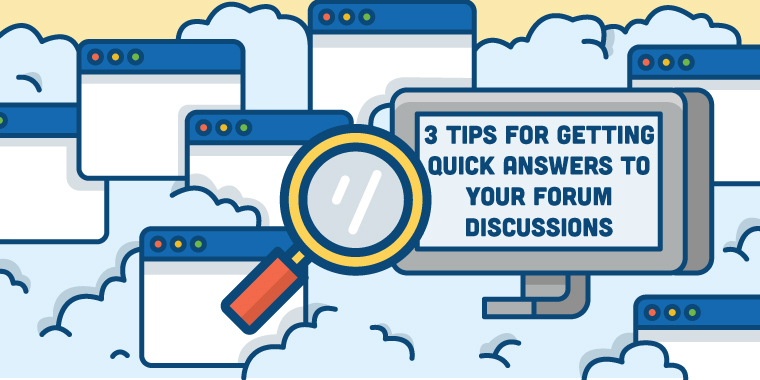 Generally, you’ll find that grouping related points—even if you end up posting them as separate, discrete discussions—will make it easier for you to keep track of the responses and easier for others to answer you. A Picture Is Worth a Thousand Words. Troubleshooting a complex interaction can be challenging for the best of us. But, when asking the community for help, a lengthy explanation of the behaviors you’re seeing (or not seeing) can take that process from challenging to confusing. That’s where some supporting visuals can do the heavy lifting. Screenshots of the behavior you’re seeing or, even better, a quick screencast or video demonstrating the problem. A link to the published slides demonstrating the behaviors. Attaching the affected slides from your project in a file such as a .story, or .pptx. E-Learning Heroes makes it painless to share screenshots, hyperlinks or video, and to attach your project files. When posting a new discussion, choose the link icon to hyperlink selected text in the body of your post. To add an image or a video, click the image or video icons. 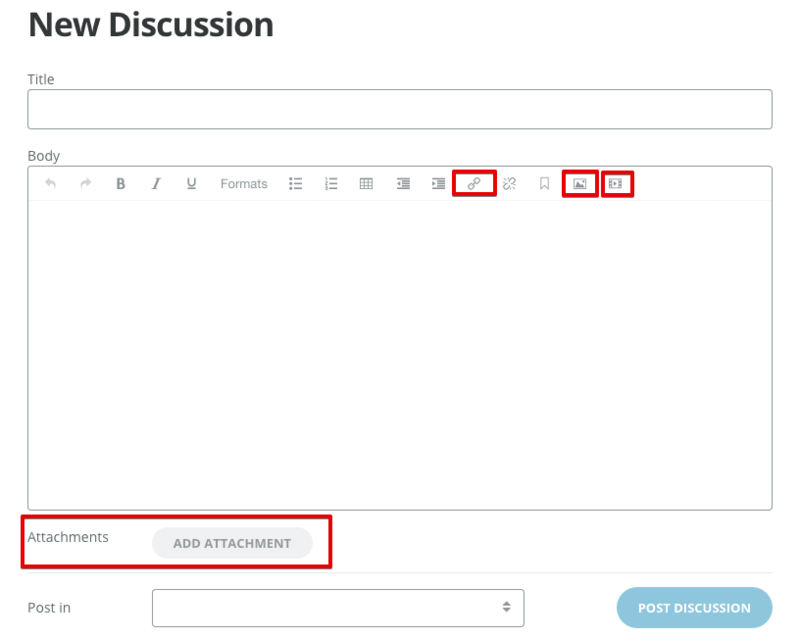 And to add a file attachment, simply click the “Add Attachment” button in the bottom left of the text field and then select the appropriate file to associate it with your discussion. Those are just a few of our hot tips for writing more compelling and effective discussion posts. What ELH discussion pointers do you have to share? Please leave us your tips and feedback in the comments. Great article, Trina. This is full of good tips! Nicely done! Thank you, Trina. This is a great way to introduce new users to the Community!